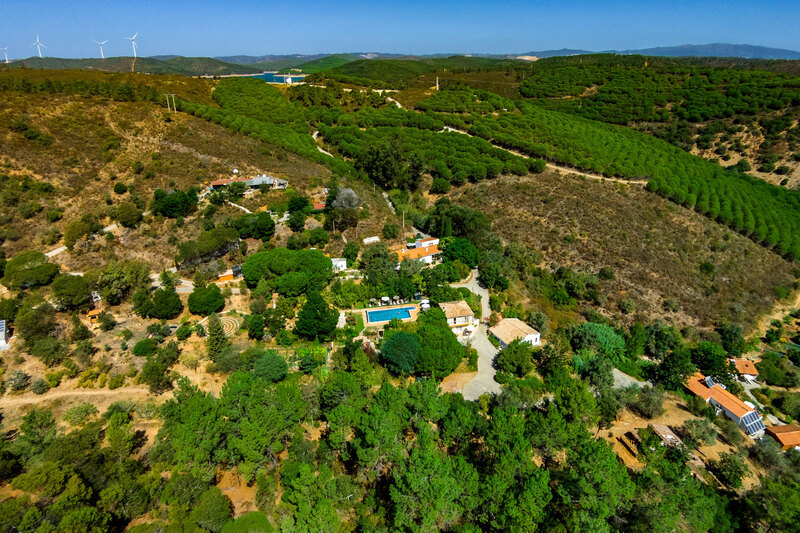 Situated in a secluded valley by the Barragem da Bravura in Algarve, Portugal, we are14 km. from Lagos on the Algarve coast. 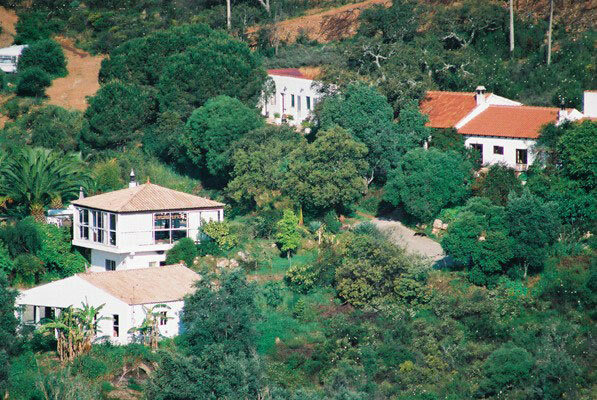 Away from the popular tourist areas we have 16 hectares (40 acres) in an area of several thousand hectares of natural beauty. It is a protected area. Here we wake up to the songs of the birds in the morning and retire with the silence of the stars at night. Yet,by car, we are only one hour from the airport at Faro, 15 minutes from the city of Lagos and 20 minutes from the nearest beaches. The 4 lane motorway is 10 minutes away. This makes it handy but at the same time we are not disturbed by any motorway noise. Once off the motorway, or when coming from Lagos ,we have blacktop municipal roads all the way to the Barragem. It is easy to get to Moinhos Velhos. The East-West motorway runs from Bensafrim to the Spanish border. In Spain we link up with the Spanish motorways. We also link with the Portuguese North South motorways, and these and the Spanish motorways are connected with most major European cities. Faro, Algarve, Portugal is an international airport with direct flights to most major European cities. For those cities that do not have a direct flight, connection is made at Lisbon. From Lagos there is train and bus service to all major European cities. From Lagos or the motorway the road is tarmac all the way to the Barragem.From the end of the municipal road we have concreted the road to our property, Moinhos Velhos,next to the Barragem da Bravura, Cotifo, Lagos, Algarve, Portugal. At Moinhos Velhos most roads are pawing stones. Today we have altogether 12 buildings on the property plus a large (160 square meter) greenhouse, a sauna and a hot-tub. The main building has a dining room and two kitchens. One kitchen is for making the juices. In the second kitchen there is a staff eating area. Adjoining the office is the living room, which is very cozy with a most efficient wood burning heater. There is also a wood burning free standing heater in the dining room. Above the living room is the main office with two computers, printers, copying machine etc. Outside the dining room and kitchen there is a large terrace with comfortable seating. In the summer time part of this area is shaded by an overhead grape vine. Just stretch out your hand and pick the grapes, which of course are off limit for the fasters. 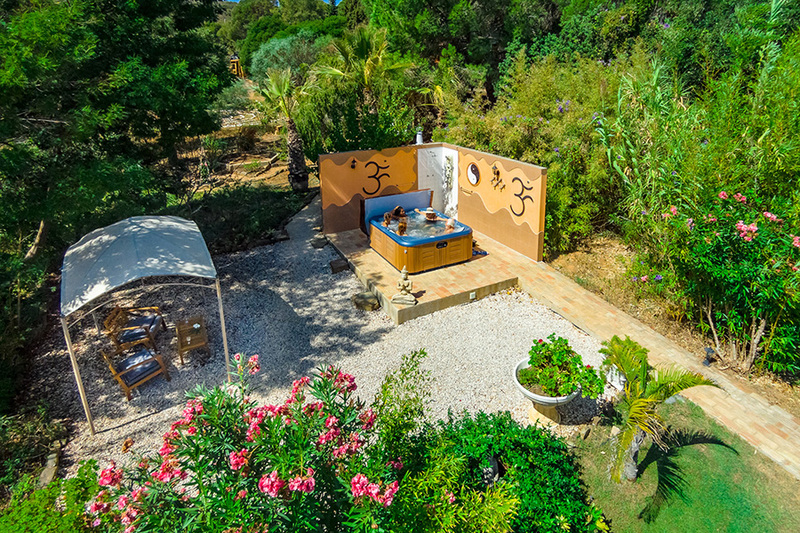 A broad stone stairway leads down to the yoga temple and pool. Below the temple there is a room with bathroom. There is also a storage area and a walk in cooler under the temple. The pool is a salt water pool. Approximately 12m x 6m we use no chemicals in the water. A special conversion units splits the salt atoms into natural chlorine and oxygen,(at least that is the way I understand it) providing a chemical free pool. It is truly a pleasure to swim in this water, it feels like silk on the skin. We use the pool 12 month of the year. In the winter when the water temperature can drop to 14 degrees, we first have a sauna and a quick dip in the pool is then most refreshing. The sauna is just below the pool. Past the temple is the clinic. This building has four rooms and one toilet. There are three therapy rooms with a selection of modern holistic therapeutic equipment..There is a reading room with a large selection of spiritual and health related books. There is a computer for guest use in the main house. Wifi in every room. 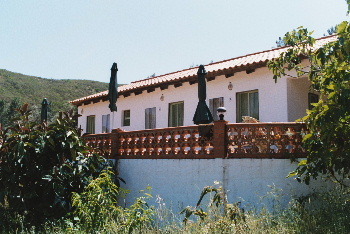 The main guest house has four rooms, 3 twin and 1 single. All with private bath rooms and individual heaters. All the bathrooms are fitted with a Clysmatic (Gravity colonic unit). Moinhos Velhos means "The Old Mills". In days before the Barragem was built this was an operating water mill, and all the neighboring farmers would bring their produce to be milled here. Apparently this goes back many hundreds of years. We have converted half the mill ruin into two single rooms. The other half of the mill belongs to our neighbour. 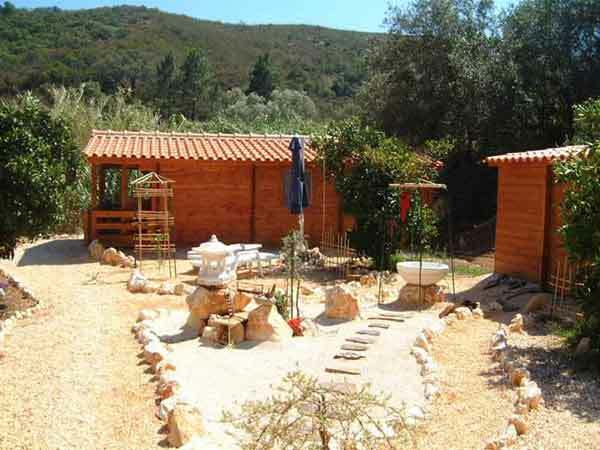 These wooden cottages are our most popular accommodation. Each cottage is about 20 square meters, plus two bathrooms and a patio. Cotifo, Lagos, Algarve, Portugal, Europe.